Creating an in-depth, informative and elegant guide for any game requires many things: reliable information, proper structure, and a good sense of aesthetics, to name a few. However, without knowledge of the workings of the MediaWiki software, these can only get you so far. If you are already experienced with the MediaWiki software, please continue to the Walkthrough on guide creation. StrategyWiki pages are made up of text. Such text is generated from three forms of interpretation: plain text, such as what you are reading now, code (HTML and CSS), and wikitext (MediaWiki's markup language). If you take a look at the source that makes up this page by clicking the edit tab at the top of the page, you'll see numerous instances of plain text and wikitext (brackets, braces, equal signs and other symbols). Wikitext serves to reduce the time it takes for contributors to write pages while reducing the file size of a page and making editing a page easier than using a combination of HTML and CSS. A list of wikitext symbols can be found at this page. Editing a page is quite simple: just click the edit tab at the top of a page, make a change, and click "Save page" under the text box. Voilà! You've made a contribution! Don't be afraid to make changes, as they can always be reverted, but please take your time to make your contributions as error-free as possible by reviewing your changes with the preview button. Fewer edits lead to less work by other people and yourself, and will reduce the history of pages that gets saved within StrategyWiki. What are histories? StrategyWiki, like all wikis, keeps a record of histories so that page changes can be documented for legal, content, and mishap purposes. It allows users to see who added what, what content has been removed, and what errors have been made and corrected at any given time and date. You can take a look at the history of this page by clicking the history tab next to the edit and move tabs. A copy of each page is saved into a history no matter what, so even if one were to delete this entire page from StrategyWiki, it could be brought back to life with a few clicks. Any user, whether registered or not, has the ability to create and edit pages. Registered users have additional privileges, such as the ability to upload images, access to a personal user page and a unique user name, which is used to track edits instead of an IP address. All users can edit any page that is not locked by an administrator. They are encouraged to participate beyond contributions by voting and raising their voices towards community issues, such as within the forums or even between individual users, in order to make StrategyWiki better. Registered users are also allowed to upload images and other content in the hopes of enhancing an article with its use. Please note that copyrighted images are not to be uploaded, although fair use of an image (like the cover of a box or a CD) is allowed. Please do not upload images that you cannot take credit for yourself or have not been given explicit permission to upload, otherwise it will be deleted. StrategyWiki only welcomes content related to StrategyWiki and its guides, so please refrain from uploading other unrelated miscellanea. When uploading content to StrategyWiki, you're required to explain what the content is in general and to categorize it under at least one of the image categories listed here. StrategyWiki gives every registered member their own public page, or profile, that can cater to their preference. If you've already signed up and logged in, you can find your very own user page right here. However, since StrategyWiki shares the characteristics of a wiki, any page that isn't locked can be modified (including user pages that aren't yours). Please respect all user pages by not editing them without the permission of its owner first. Additional to each user page, is the user's talk page, found by clicking on the discussion link in the toolbox while looking at a user's profile. Issues that need discussing with other users can take place in the user talk pages. Keeping track of many pages at once can become a tedious task. Fortunately MediaWiki implements a watchlist which registered users can take advantage of, on which you can decide what page edits you want to be notified of the moment they happen. It's categorized by date, so if a page on your watchlist was modified yesterday, it will appear in a new date bracket other than today's. If you have verified your email address, you can even opt to receive notifications by email. Every change made to StrategyWiki by you is saved on history pages, but an additional log is also created for quick reference to every change you yourself have made. Try clicking on the "My contributions" link at the top of the page to see what contributions you've made under this account so far. You can also look at other users' contributions by going to their profile and clicking the "User contributions" link in the toolbox to the right. 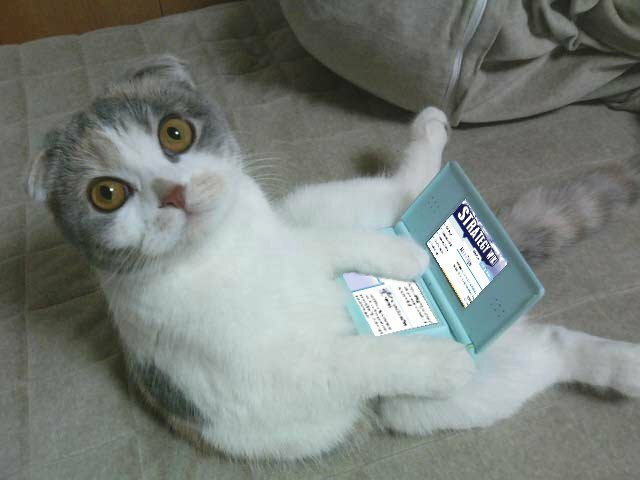 StrategyWiki: so easy to use, even Paws the cat can browse to it on his Nintendo DS. Although Paws may be comfortable browsing StrategyWiki, there are a few things you probably won't notice, especially if you're new to wikis. Our page on getting around has more detail on using and navigating the site. This page was last edited on 3 May 2012, at 01:56. This page has been accessed 15,234 times.